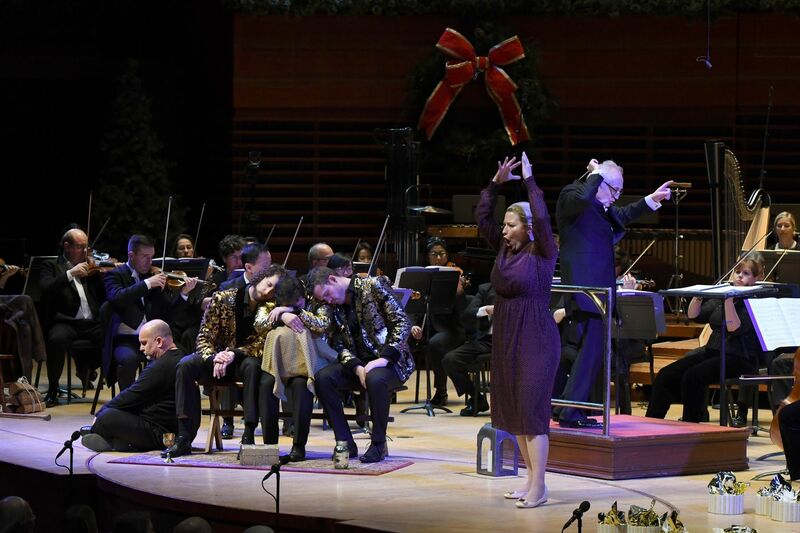 Bramwell Tovey leads the Philadelphia Orchestra in 'Amahl and the Night Visitors' at the Kimmel Center. Mezzo-soprano Renée Tatum is in the foreground. When it first appeared on Christmas Eve 1951, Amahl and the Night Visitors was the tech industry innovation of its day: an opera performed live on national television seen by millions. Later, as classical music moved to the margins, the opera’s genesis as a TV broadcast became part of a nostalgic lament for the time when a commercial network — NBC — could commission an opera and air it to a nation that still held onto the idea of a common cultural language. What is the piece today? In Verizon Hall Thursday night, Gian Carlo Menotti’s 50-minute chamber opera was performed by the Philadelphia Orchestra for the first time, and it seemed an overdue debut for a work by a local composer that has traveled the globe. After all these years, Amahl remains a gorgeous score. If its traditional musical language might have had eyes rolling as recently as a half-decade ago, its sincerity now, given the social tumult of the last couple of years, shines only brighter. Who can fail to hear its warm orchestrations and poignant harmonic progressions as anything but a paean to empathy? All that gold! All that gold! I wonder if rich people know what to do with their gold? Do they know how a child could be fed? Do rich people know? The night visitors of this work are the Three Kings, and the gold of course a gift intended for the baby Jesus. The kings have stopped at the home of a poor widow and her crippled son. Menotti, an Italian who came to study at the Curtis Institute of Music in 1928, said his TV opera was inspired in part by his own recollections of waiting up for the Three Kings as a boy at Christmas. The Philadelphia Orchestra’s production involves little more than modest costumes and a few sticks of furniture, and so the focus was on the considerable talent on stage: a strong Philadelphia Symphonic Choir of shepherds and villagers; three excellent kings (Andrew Stenson, Brandon Cedel, and David Leigh) and a page (Kirby Traylor); mezzo-soprano Renée Tatum as the mother; and the clarion sound of boy soprano Dante Michael DiMaio. Bramwell Tovey conducted (after a first half with Walton’s Crown Imperial march that could have used more volume from organist Peter Richard Conte, and the Britten Young Person’s Guide to the Orchestra). With no pit, the chamber-size orchestra on stage highlighted what’s great about the Menotti. Time after time, instrumentalists heightened a singer’s sense of yearning, despair, or triumph. Menotti has a distinct style — emotional, centered on beauty, with an occasional Puccini turn or Prokofiev twist. The value of hearing this piece with an orchestra as good as Philadelphia kept demonstrating itself. Oboist Peter Smith was a bright, playful presence in his solos, and harpist Elizabeth Hainen was the stars in Amahl’s solo about the night sky. Menotti is an effective composer and this music is widely played, but when Hainen joined the shimmering strings in “Have You Seen a Child?” it was hard to imagine the moment having as great an impact with just about any other ensemble. Impact came by way of the orchestra’s big sound and fine detailing in Britten’s Young Person’s Guide to the Orchestra. Tovey narrated throughout while conducting the piece, explaining the inner workings of an orchestra, he said, in part to benefit the children in the audience. In truth, there were few. Curiously, the two performances of this program are both at night, no doubt limiting the youth market. He described the viola as “utterly enchanting” and Mozart’s favorite instrument. “Of course,” Tovey added, “he died young.” Viola humor: you just have to be there. Additional performance: Saturday at 8 p.m. in Verizon Hall at the Kimmel Center, Broad and Spruce Sts. Tickets are $10-$158. www.philorch.org, 215-893-1999.